An international astronomy team has detected two supermassive black holes that appear to be orbiting each other in a nearby galaxy. The discovery of a likely binary black hole system suggests that supermassive black holes assemble their masses through violent unions. The black holes are located in Markarian 231, (Mrk231) – 600 million light years away, but the nearest galaxy to Earth that hosts a quasar. The central black hole is estimated to be 150 million times the mass of our Sun, while its companion is estimated to be 4 million solar masses. They orbit around each other every 1.2 years. The smaller black hole appears to be the remnant of a galaxy that merged with Mrk 231. The physical asymmetry of Mrk 231, and the long tidal tails of its young blue stars, indicate that the two galaxies merged fairly recently, at least in cosmological time scales. Quasars are the brightest objects in the universe and are powered by incredible amounts of energy. Black holes at the centers of galaxies are surrounded by large, rotating clouds of gas. As the gas is drawn in by the gravity of the black hole, it is heated to millions of degrees and emits broad-spectrum radiation that drives quasar brightness. Black holes can also eject material around them into outflows that penetrate and compress the surrounding galactic gases, driving star formation. Mrk 231 is an energetic galaxy with a star formation rate 100 times greater than our Milky Way galaxy. Xinyu Dai, professor in the Homer L. Dodge Department of Physics and Astronomy, University of Oklahoma College of Arts and Sciences, collaborated with Youjun Lu of the National Astronomical Observatories of China, Chinese Academy of Sciences for the study. The astrophysicists examined archival observations from the Hubble Space Telescope looking for ultraviolet radiation emitted from the center of Mrk 231. They then fitted a dynamical model developed by Lu to the spectrum data to predict the existence of the binary black hole system. The study suggests that two, not one, supermassive black holes may lie at the heart of many quasars, and that their pairing is the result of a galactic collision. 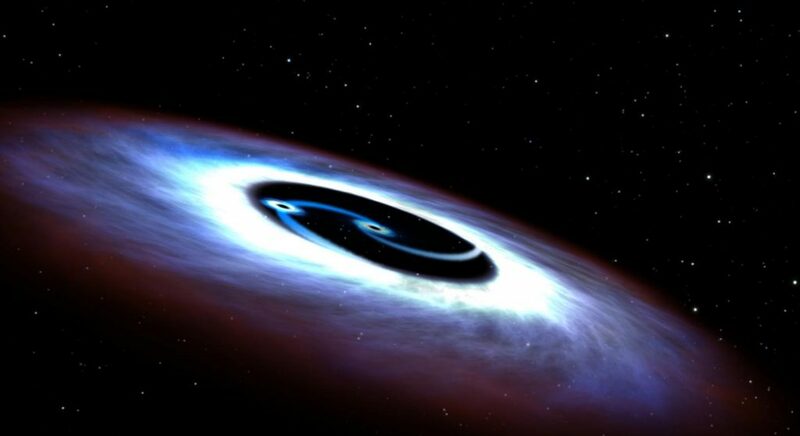 The merger of two galaxies could lead to their central black holes falling into orbit around each other, generating the immense energies needed to power a quasar. If only a single black hole were present, the surrounding hot gas of its entire accretion disk would glow in the ultraviolet range of the spectrum. The ultraviolet glow of the Mrk 231 disk, however, drops off suddenly towards the center, leaving a huge gap around the central supermassive black hole. The best explanation for this gap is the mutual orbit of the two black holes. The smaller black hole, with its own accretion disk, orbits the larger black hole at the inner edge of the larger accretion disk, cleaning out the region. The work demonstrates a new investigative approach, as well as a new science discovery. “We are extremely excited about this finding because it not only shows the existence of a close binary black hole in Mrk 231, but also paves a new way to systematically search binary black holes via the nature of their ultraviolet light emission,” said Lu. The binary black holes of Mrk 231 are predicted to spiral together and collide within a few hundred thousand years. That final, violent merger should form a quasar with a single supermassive black hole at its center. Although the lifespan of quasars isn’t certain, the process behind their formation may be a common feature of the universe. “The structure of our universe, such as those giant galaxies and clusters of galaxies, grows by merging smaller systems into larger ones, and binary black holes are natural consequences of these mergers of galaxies,” said Dai.